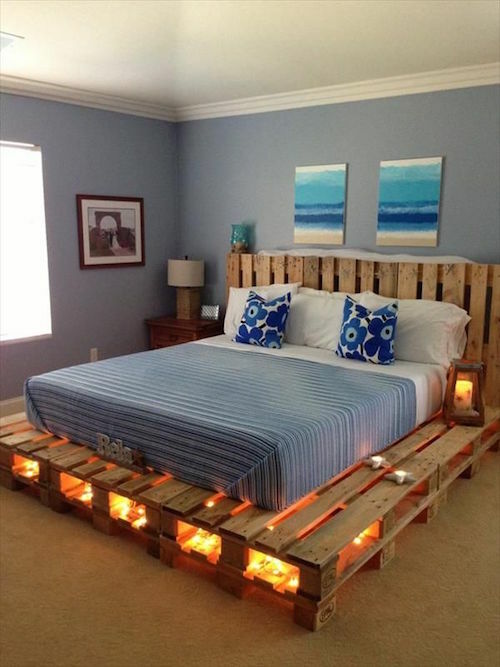 Wood pallet beds are so in style these days! We have one (seen on the next slide) and I think this style is not only gorgeous, it’s unique! From pallet beds, to decorated wood stairs, and other gorgeous wood ideas, you are sure to be inspired by what you see here! This really is amazing! If you’re short on space, consider getting one of these. 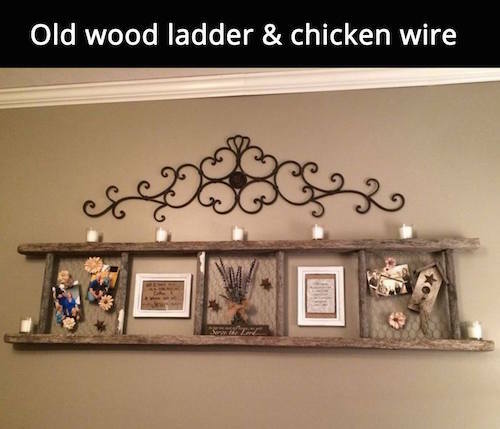 Paint it or decorate it however you want! 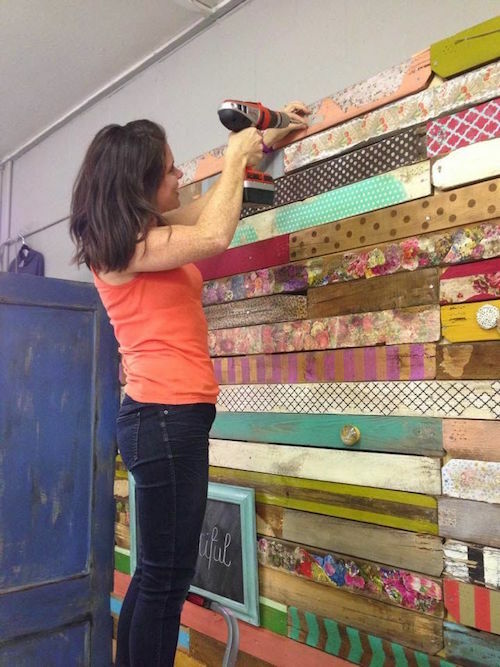 A wood pallet wall decoupaged with tissue paper, scrap book paper, napkins, fabric, magazine clippings and wrapping paper. Love this! 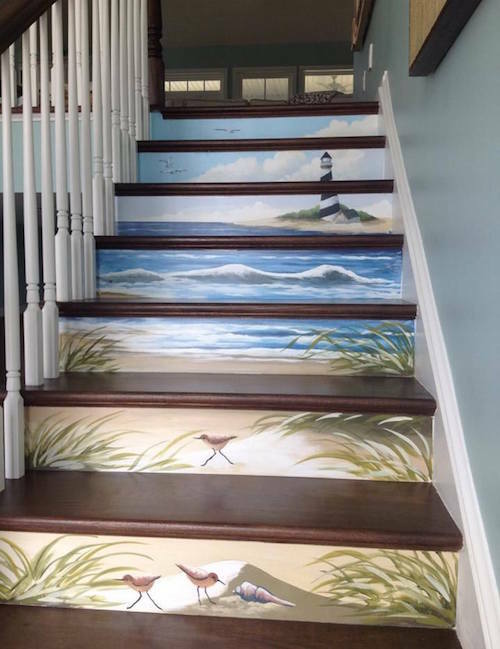 Wooden stairs decorated with scraps of wallpaper. WOW! How neat is this? This bed is made by Mary St.Clare. I love how she used white Christmas lights underneath. It looks gorgeous! 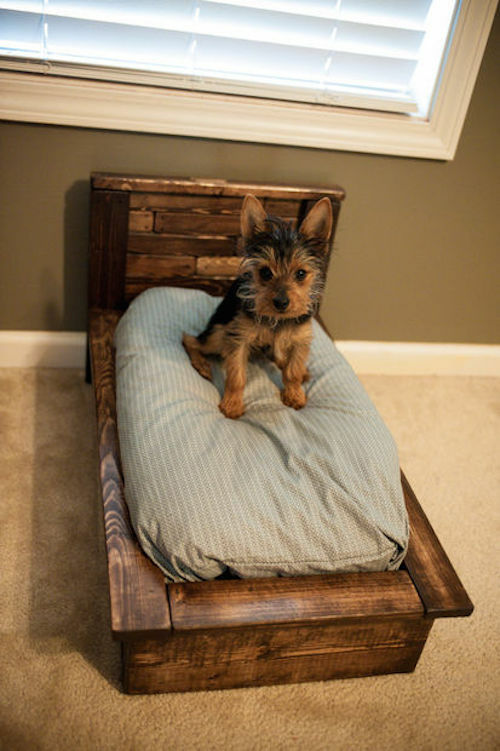 Make a wood pallet bed for your dog! So cute! I love how it is lit up! (original source unknown). Get the waterproof lights to illuminate the pallet bar with an auto on/off timer HERE. What a great idea! (source unknown). I love the white with the soft pink flowers and lantern. So pretty! (source unknown). Click HERE to have a pallet patio set like this made. 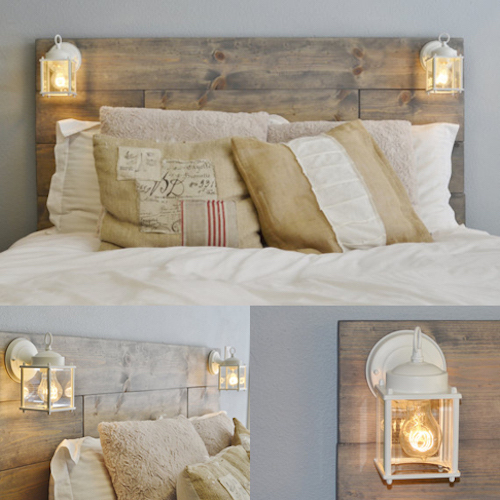 Click the back and forward buttons below for more amazing and beautiful pallet ideas! 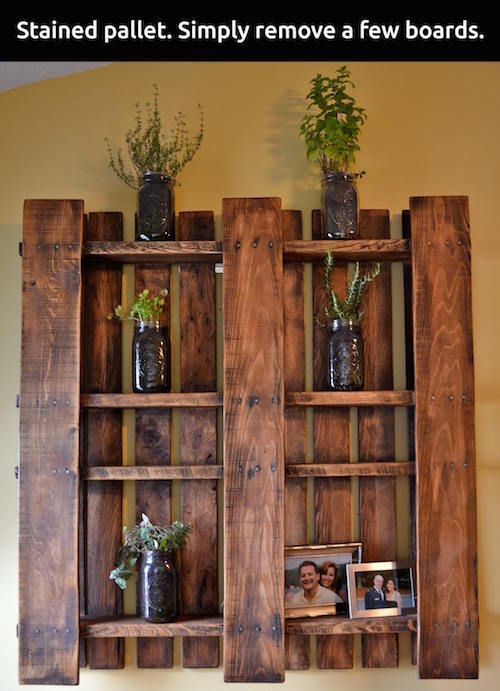 Remove a few boards from a wood pallet, finish it with a beautiful stain, and hang it. Easy enough! 16. Where bar and table meet! 17. 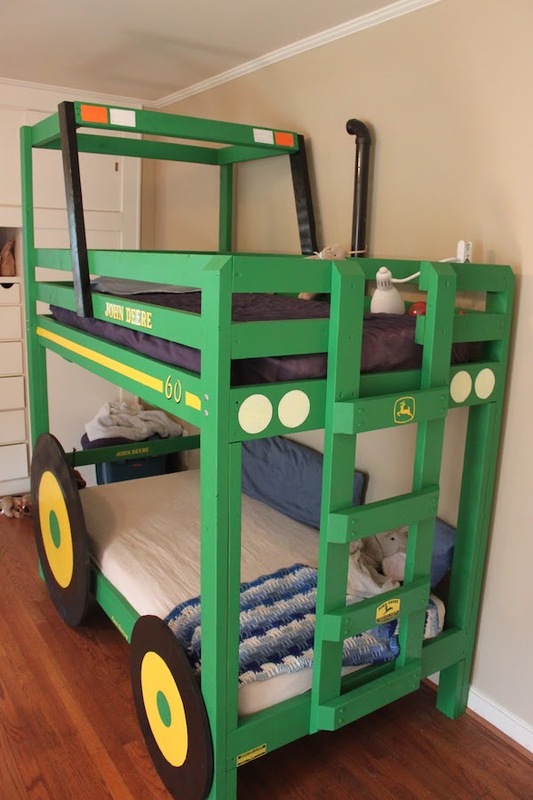 Homemade TRACTOR BUNK BED! One very creative dad made this for his kids. What lucky kids they are! My son would love to have a bunked that looks just like a tractor. Do you know of anyone who might like this? Here’s an amazing idea! 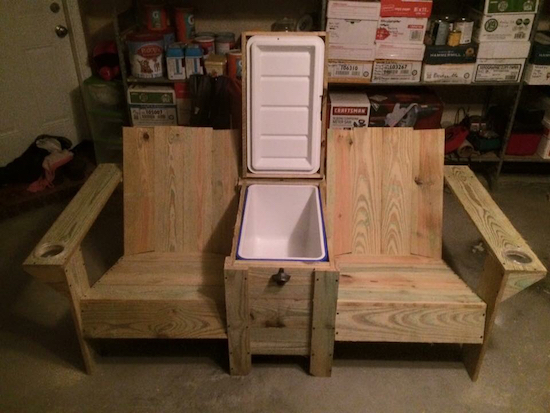 What do you think of this outdoor bench with a built in cooler? You can purchase one HERE or you can see how to make one here. So cute! 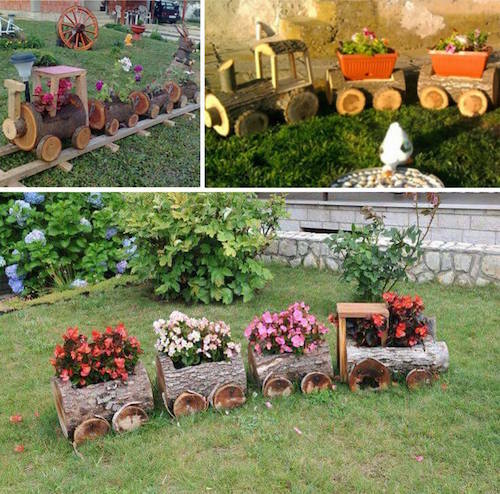 Trains made out of wood logs and filled with flowers. (source unknown). So cute! Get the hanging solar lights HERE and attach them to the back or place them on taller shepards hooks like THESE. Use a hanging flower box (like THIS). Great idea! Source unknown. 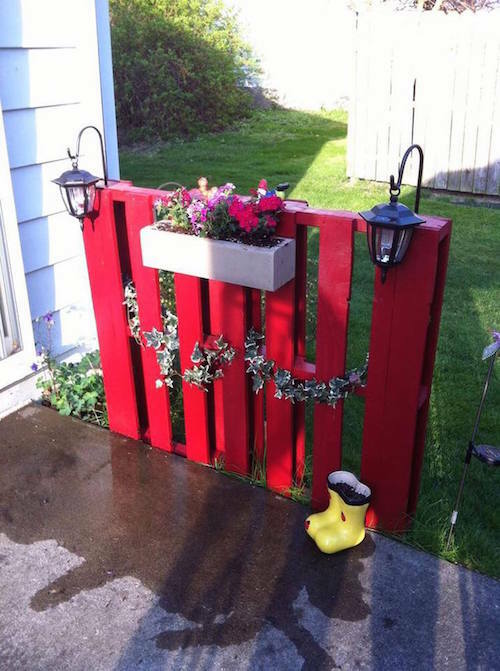 This is so creative and resourceful! I love it! I love these Idea’s they look really nice. The wood kids beds/playhouses are such a creative use for pallets. 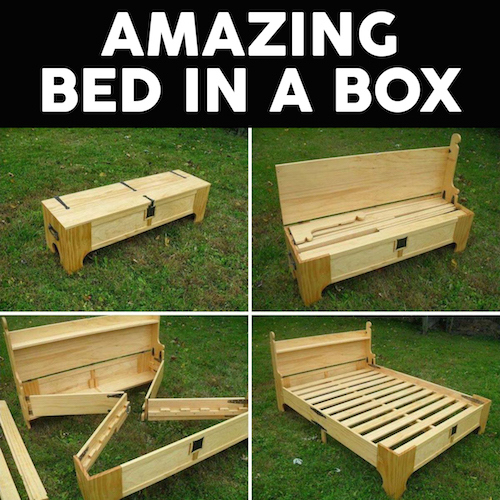 I would love to build something like that-what a treat for kids to sleep in every night! 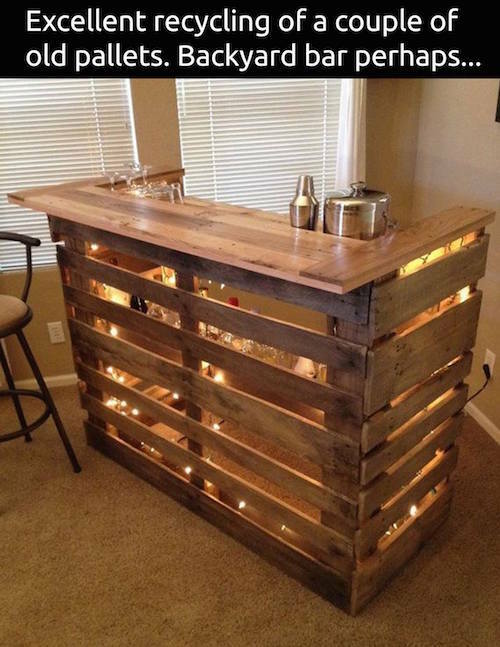 I’m trying to find the instructions about how to make this pallet bar. Can you tell me where to find them? Thanks! I love this! I’m so sorry! I’ve been looking too. If I can find them, I’ll be sure to let you know. Isn’t it AMAZING? 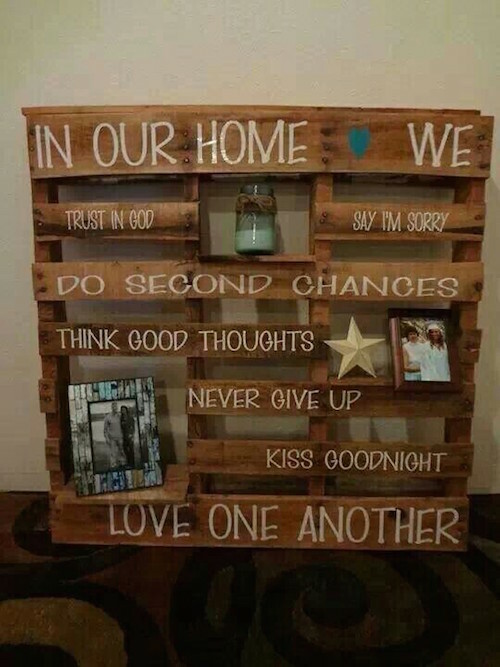 Those are some nice ideas to reuse wooden pallets. 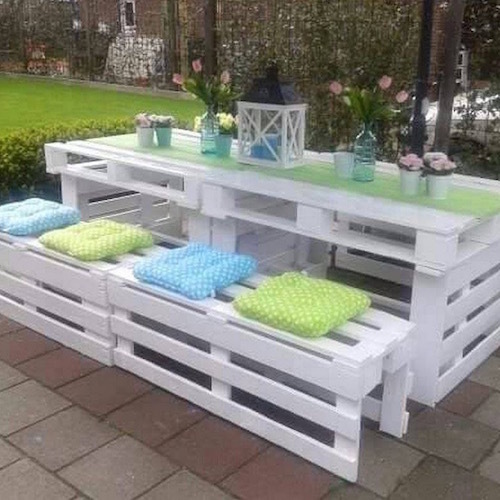 I have lots of these wooden pallets by the backyard and been wondering what to do, thanks I came across this post and I now feel that they have work to do and some space to fill. 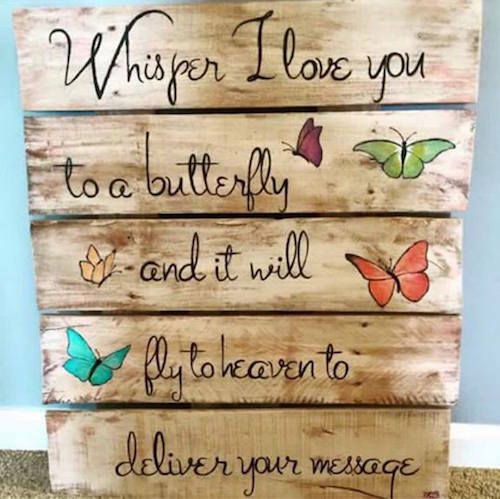 I loved that painted pallet garden and I think we should make something similar. Thanks for the inspirations. 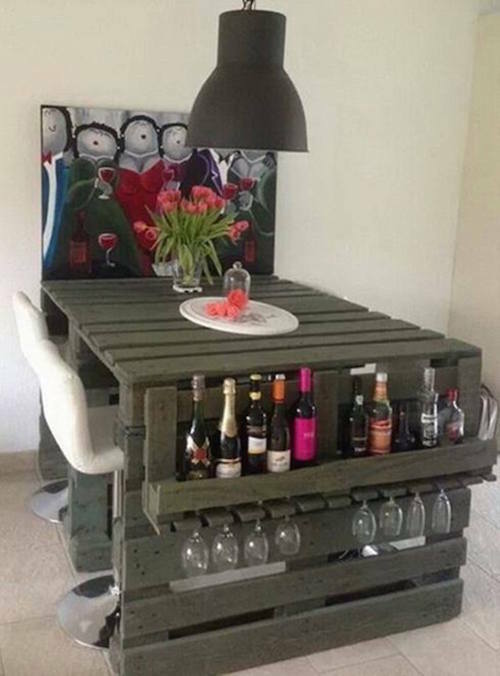 Love pallet furniture. My husband builds all kinds of it. My home has several pieces that he built. And yes he builds just about anything out of pallets. He has built this bar for someone already. Need anything built from pallets just let me know. Prices on all his work is very reasonable. He has built wine racks, spice racks, towel racks, bedroom furniture such as beds, dressers with mirror, night stands. And the list goes on. He also built a lady a moonshape baby bed. 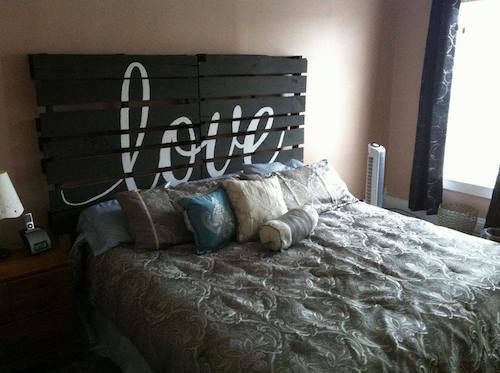 These are some really nice wood and pallet design ideas. The crate shelving unit near the end (no. 31) is really nice, and I love the incorporated lighting. 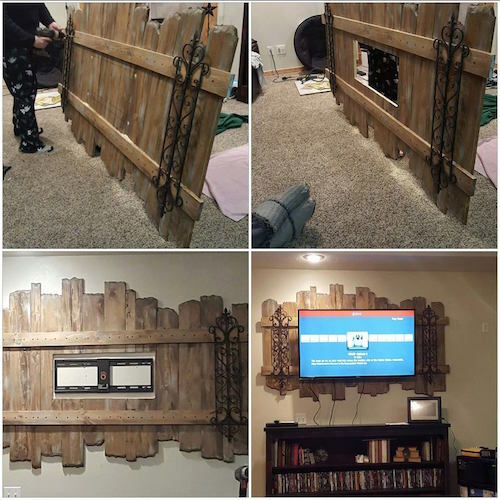 I may have to try something like that, I have a good deal of pallets and crates I’ve been saving for some cool DIY furniture. Thanks so much for writing!